Twin Lamb is a soft cotton pant set made by hand at TEMAK, Teenage Mother’s Association of Kenya. This organization assists young women to become independent through training. One of the training options is sewing. 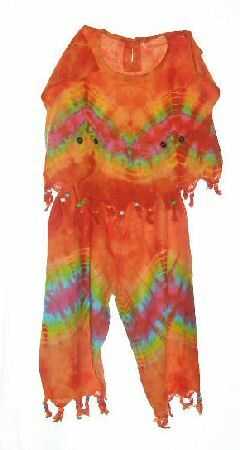 This outfit is made of tye dye viscous cotton. It is marked a 2. As sizing can be inaccurate, we measure each article lying flat on a table for better fit. The top has short cap sleeves and measures 9 1/2″ from shoulder to shoulder, 14″ across the chest and 12″ from sholder to beaded fringe hem. There are two front Lamb pockets with fabric “ears” and button eyes. The round neck has a one button V closure on the back. The pants have an elastic waist that measures 14″ relaxed and 24″ fully estended. There is one side pockets. It measures 18″ from the waist to the beaded fringe hem with a 10″ inseam.